Unexpected behavior in ferroelectric materials explored by researchers at the Department of Energy's Oak Ridge National Laboratory supports a new approach to information storage and processing. Ferroelectric materials are known for their ability to spontaneously switch polarization when an electric field is applied. Using a scanning probe microscope, the ORNL-led team took advantage of this property to draw areas of switched polarization called domains on the surface of a ferroelectric material. To the researchers' surprise, when written in dense arrays, the domains began forming complex and unpredictable patterns on the material's surface. "When we reduced the distance between domains, we started to see things that should have been completely impossible," said ORNL's Anton Ievlev, the first author on the paper published in Nature Physics. "All of a sudden, when we tried to draw a domain, it wouldn't form, or it would form in an alternating pattern like a checkerboard. At first glance, it didn't make any sense. We thought that when a domain forms, it forms. It shouldn't be dependent on surrounding domains." After studying patterns of domain formation under varying conditions, the researchers realized the complex behavior could be explained through chaos theory. One domain would suppress the creation of a second domain nearby but facilitate the formation of one farther away—a precondition of chaotic behavior, says ORNL's Sergei Kalinin, who led the study. "Chaotic behavior is generally realized in time, not in space," he said. "An example is a dripping faucet: sometimes the droplets fall in a regular pattern, sometimes not, but it is a time-dependent process. To see chaotic behavior realized in space, as in our experiment, is highly unusual." Collaborator Yuriy Pershin of the University of South Carolina explains that the team's system possesses key characteristics needed for memcomputing, an emergent computing paradigm in which information storage and processing occur on the same physical platform. "Memcomputing is basically how the human brain operates: Neurons and their connections—synapses—can store and process information in the same location," Pershin said. "This experiment with ferroelectric domains demonstrates the possibility of memcomputing." 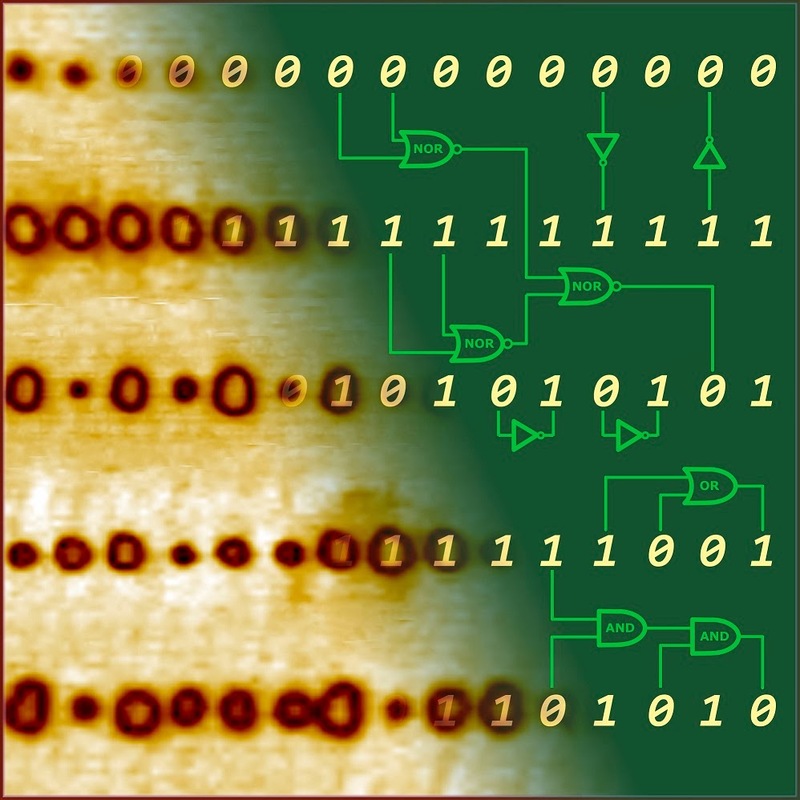 Encoding information in the domain radius could allow researchers to create logic operations on a surface of ferroelectric material, thereby combining the locations of information storage and processing. The researchers note that although the system in principle has a universal computing ability, much more work is required to design a commercially attractive all-electronic computing device based on the domain interaction effect. "These studies also make us rethink the role of surface and electrochemical phenomena in ferroelectric materials, since the domain interactions are directly traced to the behavior of surface screening charges liberated during electrochemical reaction coupled to the switching process," Kalinin said.